A new addition to The Highlander Inn's bottling range. 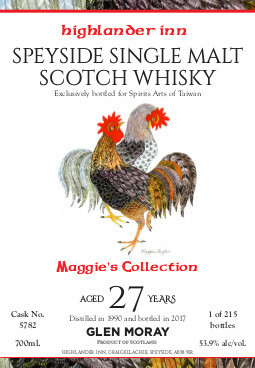 To meet the high demand there has been for bottlings, especially this current year, we have decided to launch a new range called Maggie's Collection. These bottlings take their name from Maggie Riegler, a local artist whose works adorn their labels. Maggie is a well-known and established artist who resides in Craigellachie; you may recognise her artwork from a number of our previous annual single cask releases. She designed the labels of these bottlings until 2012, when Hans Doillesse, a good friend of the Highlander Inn took up the mantle. There are however, many other masterpieces created by Maggie, which we here at the Inn love. We are delighted to be able to showcase more of them to you in this new range. All of the releases under the title of Maggie's Collection will be exclusive to one particular market. The first release, a 27 year old Glen Moray, will be bottled exclusively for Taiwan and available through the distributor "Spirit of Arts".